Brick Fanatics Magazine Issue 5 available now. Issue 5 of Brick Fanatics Magazine explores the very origin of LEGO Star Wars and is available to order online now LEGO Star Wars themes the latest issue of Brick Fanatics Magazine, as Issue 5 heads 20 years back in time, to when Lucasfilm and the LEGO Group first sat down to discuss creating a series of construction toys based on a galaxy far, far away. Exclusive interviews with some of the handful of people involved at the very start explain exactly how LEGO Star Wars came to be, delve deep into the design process that went into creating that very first wave of sets, and reveal the building blocks put in place that paved the way for the next two decades of success. We also attempt to pick out the five LEGO Star Wars sets that most define what 20 years of LEGO Star Wars has been, and there is at least one surprise inclusion. This latest issue of the print publication all about LEGO also tackles the powerful RC Stunt Racer Technic set, and offers a solution to the imbalanced drive that it has. Senior Designer at the LEGO Group, Rok Žgalin Kobe, reveals some fascinating insight on the Architecture set San Francisco in an exclusive set walkthrough, whilst in our How To section we try to discover other ways to use the new CITY parachute element, and consider how composition can make all the difference in shooting LEGO on your phone. Issue 5 of the A5, 80-page magazine is packed with all of the above plus even more insight, ideas and inspiration on all things LEGO. Single copies (with an additional charge for postage and packaging) of Issue 5, as well as 12-issue and 24-issue subscription packages from Issue 5 that offer free issues, free postage and delivery of every issue fastest and first, are available to order now at brickfanatics.com/magazine. Orders will begin to ship towards the end of April. 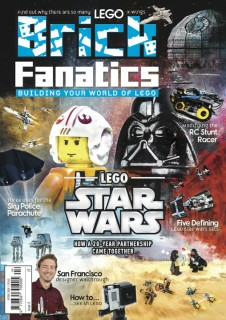 Brick Fanatics Magazine is also available in store in the UK and US. Issue 4 is currently in UK WHSmith stores, whilst Issue 3 is due to hit US Barnes & Noble stores from April 18. Stockist information can be found here. I just have one thing to say: not MORE legos! As it is I'd be spending thousands of dollars a day if I could. I don't want there to be more stuff I need to buy! this magazine is great for any lego enthusiast! I have an extra copy of 1-3 if anyone is interested? cover shipping and they are yours. Having trouble getting issue 4 at the moment. The Whsmiths that should stock it haven't got it. When will issue 5 be in UK stores?